Our partner Discover Your Forest, in collaboration with the Deschutes National Forest and Mt. Bachelor Ski Area, will begin their annual interpretive snow tours in the next few weeks. Beginning December 16, 2017 visitors to the Mt. Bachelor Ski Area can go on a snowshoe tour with a ranger, then on January 6th, 2018 visitors can ski or snowboard Mt. Bachelor slopes with a ranger, or chat with a roving ranger around Mt. Bachelor. All interpretive programs focus on the ecology, geology and wildlife of the Cascades. Snow conditions permitting, snowshoe programs will start Saturday, December 16, 2017 and run through Saturday, March 31st, 2018. 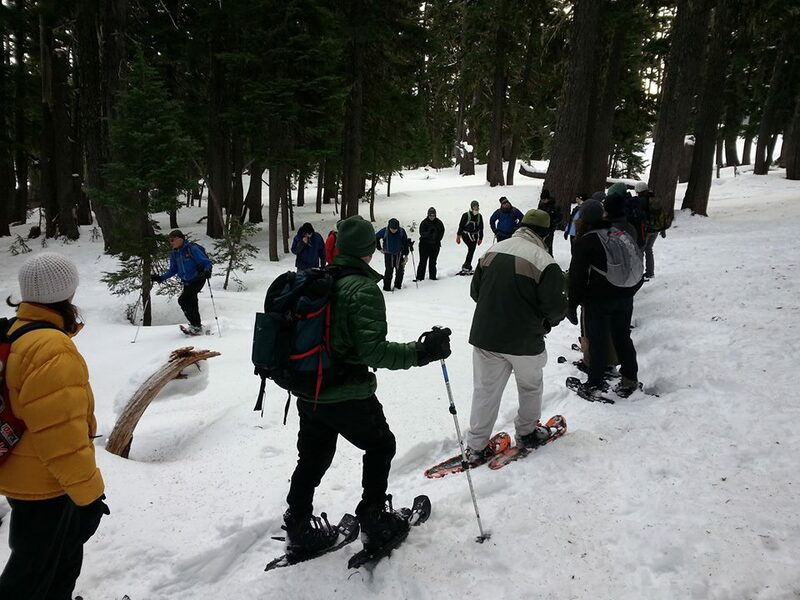 Interested participants will meet at the Forest Service snowshoeing hut located at Mt. Bachelor’s West Village at 10 a.m. and 1:30 p.m. on weekends and school break week days with the exception of Christmas and New Year’s Day. Tours last 90 minutes and snowshoes are provided for the tour. No prior experience is needed. Participants must be 8-10 years or older and should dress appropriately for cold weather. On weekends beginning Saturday, January 6, 2017 and running through Saturday, March 25th, 2018, an interpretive ski and snowboard tour will be offered on Mt. Bachelor’s groomed runs. The tour, which lasts an hour, begins at the top of the Pine Marten lift (to be determined) at 2 p.m. Participants are responsible for having lift tickets and appropriate equipment, as well as, basic riding skills. In addition, skiers and snowboarders will find interpretive rangers roving between Outback and Sunrise Express lifts ready to answer questions. If you have any questions, please contact Karen Gentry, Discover Your Forest’s director of education at (541) 383-4771, Stacey Cochran, DYF’s Community Engagement Director or (541) 383-5530 or check the Snowshoe/Ski with a Ranger Hotline at (541) 383-4055 for up-to-date tour information.